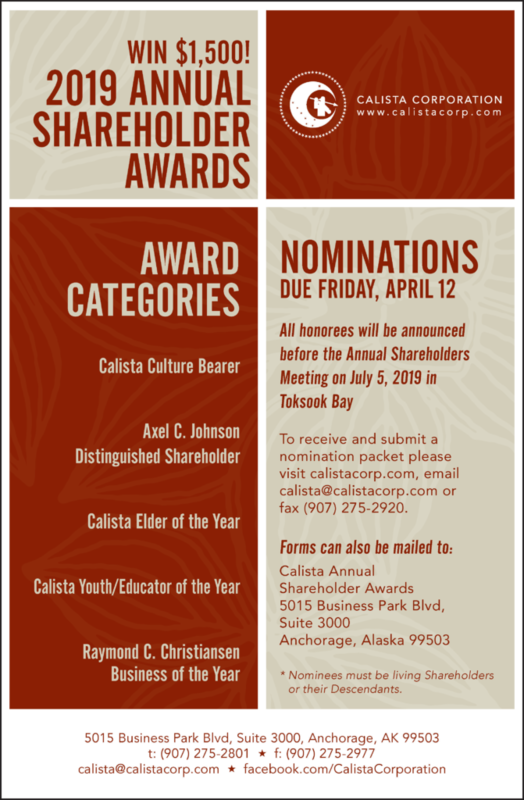 Calista Corporation opens nominations for the 2019 Shareholder Awards. The Calista Awards are focused on Calista Shareholders and Descendants. Nominations are open to Shareholders and Descendants living in and out of the Calista Region. Each award recipient will receive a plaque and $1,500. There are five different categories. The award categories are as follows: Calista Culture Bearer, Axel C. Johnson Distinguished Shareholder, Calista Elder of the Year, Calista Youth/Educator of the Year, and Raymond C. Christiansen Business of the Year. Nominees must be living Shareholders or their Descendants. Nominations forms are posted on the Annual Meeting page. Nomination forms can also be requested via fax (907-275-2920) or by email (calista @ calistacorp . com). Forms must be received by Calista no later than 5pm on Friday, April 12, 2019. All honorees will be announced before the Annual Shareholders Meeting on July 5 in Toksook Bay, Alaska.